Nick Henry has had an interesting last 12 months, as he’s had to make a couple key decisions about his hockey (and life) future. Those decisions have seemed to bear some interesting fruit for the Manitoba product, at least in the short term, as he’s had one of the more impressive showings of any first-year eligible player in his draft class. Originally drafted by the Everett Silvertips out of bantam, Henry hung around in Manitoba midget and junior A for the next couple seasons. He put up very strong numbers at those levels and seemed destined to pursue his education and hockey at Western Michigan University. 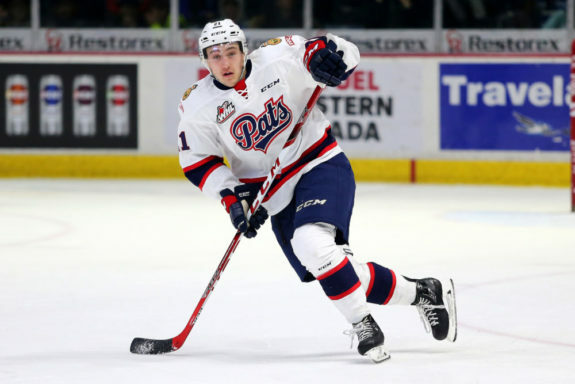 The Regina Pats took a minor gamble at last year’s bantam draft, sending a second round pick and a sixth round pick for Henry’s rights. He ended up choosing the Pats over the NCAA, signing with the club in the fall. Henry was a strong contributor on one of Canadian major junior hockey’s most stacked teams. He was a point-per-game player as a rookie, finishing second in the entire WHL in rookie scoring behind Swift Current’s Aleksi Heponiemi. Relied upon to be a distributor of the puck and a secondary offensive threat, Henry was up to the challenge and chipped in consistently throughout the year with offense at key moments. The big question regarding Henry is whether he could produce at the same level on a less stacked team. He definitely benefited from Regina’s ability to put him in favourable circumstances, but he was also full marks for maximizing his outputs in those circumstances. He’s only produced at a high level in a tough league for one season, and that production came on the WHL’s version of the Harlem Globetrotters, but Henry is a really intriguing prospect. There are more complete players with more extensive resumes that will probably go before him in the draft, but he’ll be a great value pick for an NHL club in the middle of the 2017 Draft. If he can build upon a stellar rookie year in the Dub, he may even turn into a steal over time. Based on projections and rankings that are out there, Henry could go as early as the late second round or as late as the end of the fourth round. “Nick Henry is a crafty rugged forward fitting in with powerhouse Regina in his first season in the WHL. A real good playmaker that has good vision and will look to pass first but has shown a good shot and will shoot from anywhere on the ice. Cycles the puck well down low and is tough to push off the puck. Has shown improvement in his skating over the course of the season but still has room for improvement.” – Marshall Mackinder, Hockey Now. Henry projects as a middle six forward at the NHL level. Henry was named the MJHL Rookie of the Year last season.